It’s five in the morning in Birmingham. The dark neighborhoods are quiet and students try to get in a few more hours of rest before starting their day. While Seaholm sleeps, senior Audrey Belf is starting her morning run. This jog is the first of the two she will endure during that day. Even during the seasons of cross-country and track she is determined to do more than the five cross country practices per week. Audrey Belf began her running career in the sixth grade with the Covington track team. In addition to track, she also swam competitively and played soccer. In the fall of eighth grade, she added cross-country to her schedule and narrowed down her wide range of sports. She said that she ended her swimming and soccer careers and started running full time. “I could not be happier with my decision to run cross-country and track,” Audrey Belf said. Along with running up to twelve times a week, Belf attends about one track or cross-country meet per week and signs up for additional meets during her off seasons. “In June I generally race in about three post-season national meets,” she said. Audrey Belf even travels across the country to race in these national meets. Richard Belf, Audrey Belf’s father, makes sure that either himself or his wife attends every single one of these meets, no matter what the location. These national meets aren’t open to any runners either. According to Richard Belf, she is frequently invited to exclusive meets for the top high school runners across the country. Audrey Belf tries to fit the national meets in when she isn’t running for the Seaholm cross-country and track team. She focuses a lot of attention on these seasons due to the fact that she is one of the top runners on both teams. Along with the pressure of helping the team with scores, she must also be a leader for the younger runners on the team. 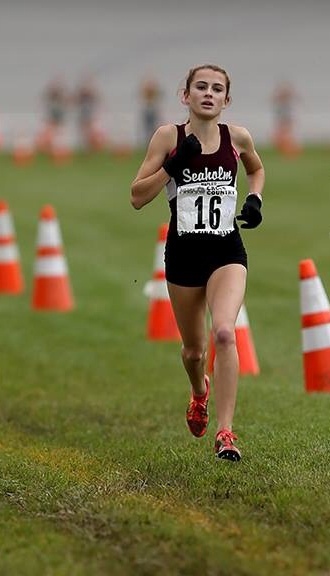 The Seaholm girls cross-country and track coach Jeffrey Devantier believes that she is also an asset to the team as a leader. According to Audrey Belf, some of her greatest accomplishments were achieved at the Seaholm meets throughout the last three years. “My biggest accomplishments include a cross country state championship, a team cross country state and national championship, two indoor 3200 state championships, an outdoor track 3200 state championship and a 4X800 state championship,” she said. She also placed third in the All American Finishes at Nationals in 2013 and second in 2014. Not only does Audrey Belf have success in her running career, but she also enjoys the sport and spending time with her teams. Audrey Belf mixes her love of running with her determination to succeed in order to get up and jog each morning. According to Audrey Belf, she sets lofty goals to keep her determined mindset. Even though she sets personal goals for herself, Devantier, he said, also has goals for Audrey Belf that he strives to achieve. “My goals for her are for to continue to evolve as a runner and for her to handle all race conditions and the competition no matter what the level of the race,” Devantier said. He believes that the best way for her to achieve these goals is to stay healthy and motivated while balancing her hectic schedule. Richard Belf is also there to offer his support and advice throughout Audrey Belf’s running career. He added that he wakes up at five in the morning to guide Audrey with his car in the morning darkness. He does this to make sure that she is safe and well during her jog. Richard also believes that he doesn’t need to put pressure on her to succeed because she is so determined on her own. According to Richard Belf, Audrey has also kept up excellent grades throughout the duration of her high school career. He said that they have been working together to narrow down the college offers she has received. “Now we need to help her find the school that will be a great fit for her academically as well as for her continued development in running,” Richard Belf said. After college, Audrey Belf says she has high hopes for the future. She plans to keep training in the sport she loves to one day achieve what most think is impossible. “I strive to make an Olympic team one day,” she said. At five in the morning she will think of this dream as she starts her morning jog, while the rest of the city sleeps.